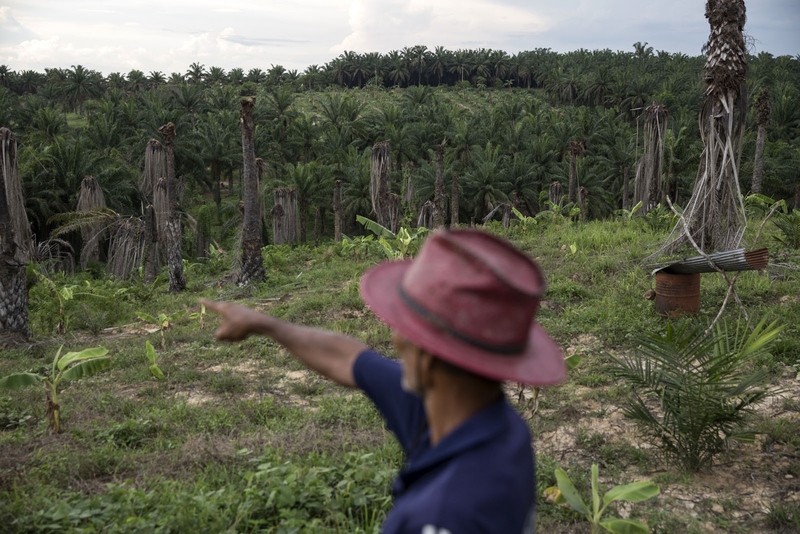 On 12th November 2012, two Thai women were found dead at the edge of a palm oil plantation, a mere 800 meters from the sand-bagged security post that marks the guarded entrance to their community. Littered among their bodies were the 10 bullet casings from the assault rifle that killed them. The joint murder was a clear warning to their small village of Klong Sai Pattana in Surat Thani, southern Thailand. 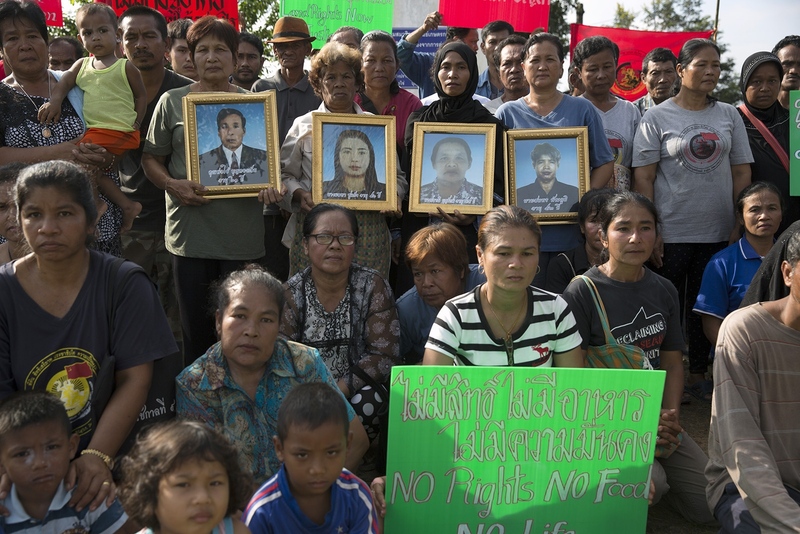 The victims – Montha Chukaew, 54, and Pranee Boonrat, 50 – had spent the last four years fighting the Jiew Kang Jue Pattana Co. Ltd palm oil company in a land dispute that has engulfed this small community of around 70 families. 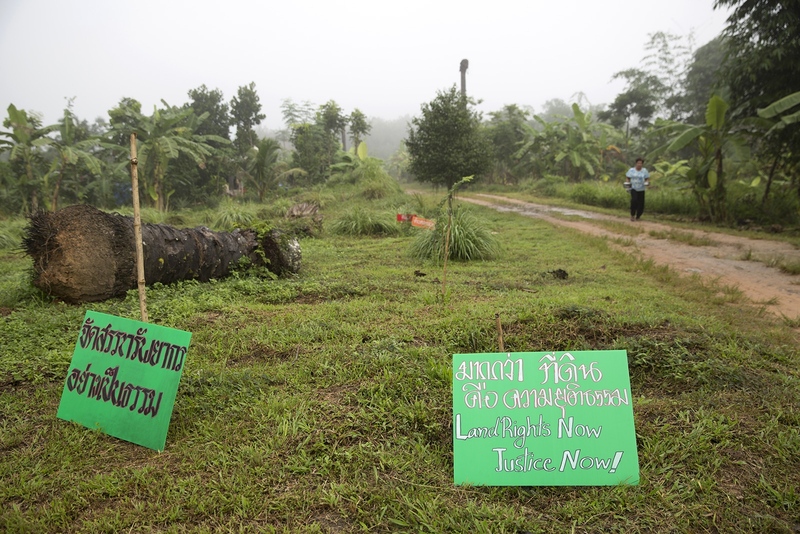 For decades a palm oil company called Jiew Kang Jue Pattana Co. Ltd had illegally occupied and harvested palm oil trees on a 168-hectare plot of land in Chai Buri District of Surat Thani Province in Southern Thailand. 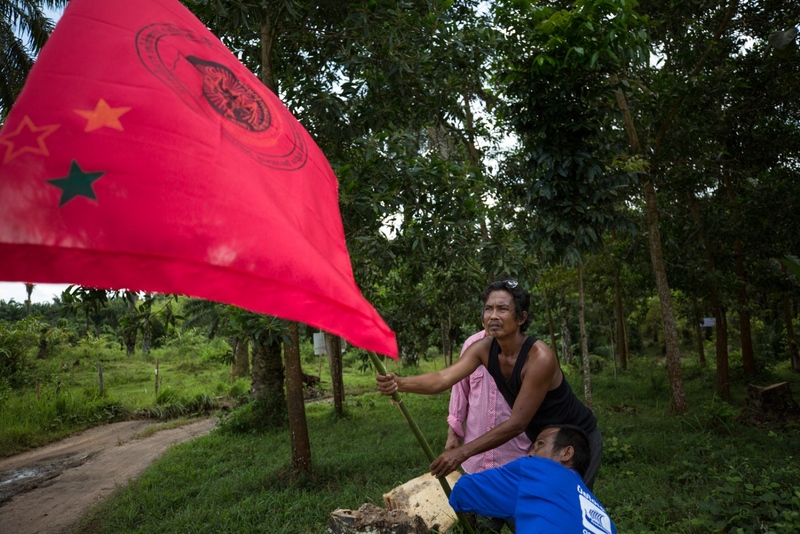 With no land title deed or legal documentation the company had gone unhindered for such a long period of time until their presence caught the interest of the Southern Peasant’s Federation of Thailand (SPFT). 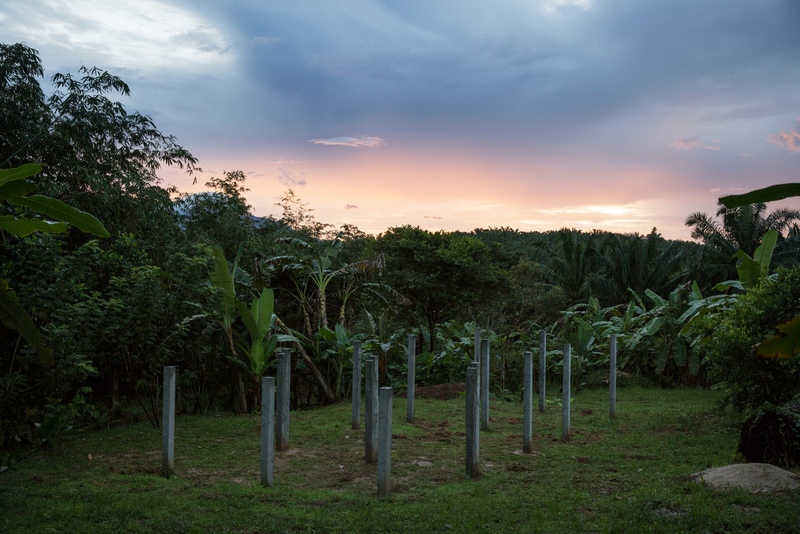 Formed in 2008 but with its roots in a land reform movement that started in the early nineties in the province of Surat Thani, SPFT works on behalf of landless farmers to secure them land with which to farm. It’s very being rose from the inability of farmers to count on the Government to act independently or the companies in question to regulate themselves by following the laws. After having collected detailed evidence of Jiew Kang Jue Pattana’s illegal occupation they presented it to the Agricultural Land Reform Office (ALRO). As a result of this information in 2005 ALRO sued the palm oil company for illegal land encroachment of this 168-hectare plot plot. 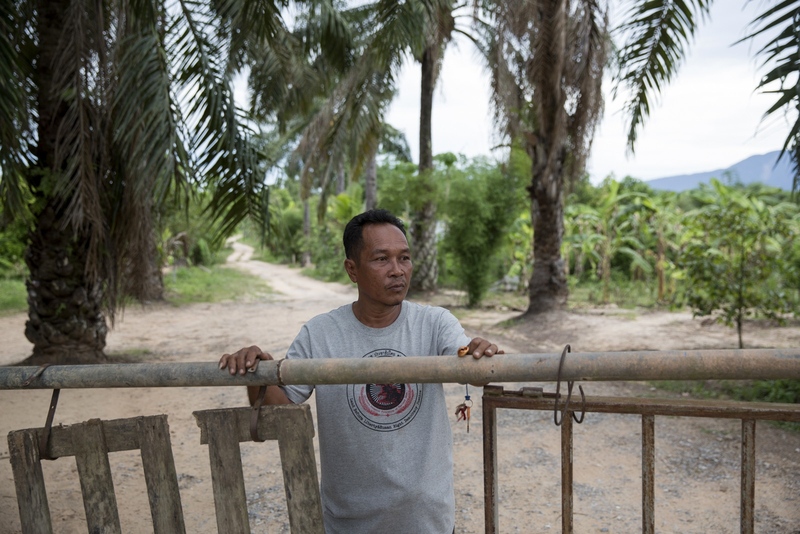 This court case was won by ALRO in the Provincial Court in 2007, and with the land in the hands of the very office who’s existence is to help land-less farmers acquire land, the Southern Peasant’s Federation of Thailand (SPFT) moved on to the land in 2008. Yet they never expected the retaliation that then ensued and found themselves subjected to increasing violence that ultimately lead to the shooting and killing of their first community member, a man by the name of Somporn Pattaphum, in 2010. Between then and 2016 a total of four people have been shot dead, including two women in 2012, with no-one being held to account for these deaths. The most recent shooting in April 2016 was of Mr Supot Kalasong who remarkably survived but his father-in-law Chai Bungthonglek wasn't so lucky in 2015. The shadow of eviction still looms over the residents who fear their homes and lands could be casualties of bigger interests they cannot control and of acts happening outside the due process of law. The legal situation of the community is still unsettled and they live under constant threat of eviction and fear for their lives. In February 2017 the final verdict of Mr Supoj Kalasong’s attempted murder case was announced at the Weangsa Provincial Court in Surat Thani Province. The case against the gunman, like all previous cases, was thrown out of court for lack of sufficient evidence collected at the crime-scene and during the investigation. The family was devastated as the continuous and repetitive pattern of violence and direct intimidation aimed at discouraging them from pursuing a community land title in this fertile and contested piece of land goes unpunished. 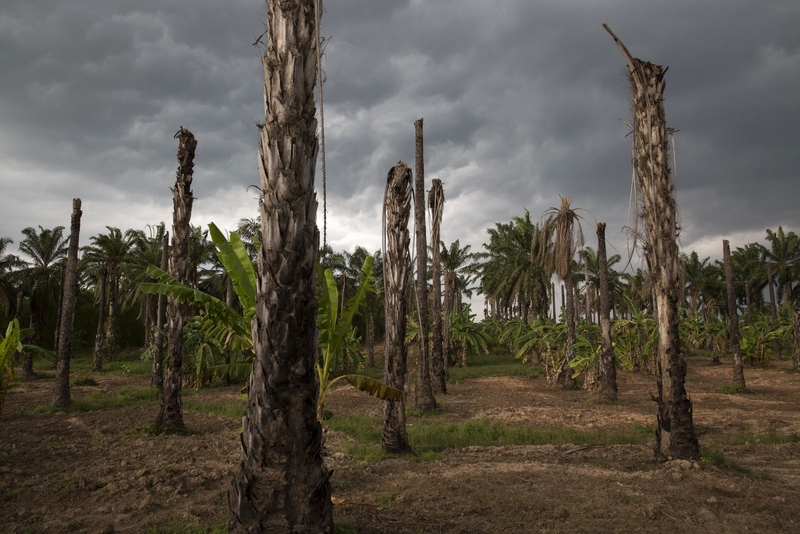 A storm moves over an area of dead palm oil trees that the villagers have started farming other produce. May 2016. 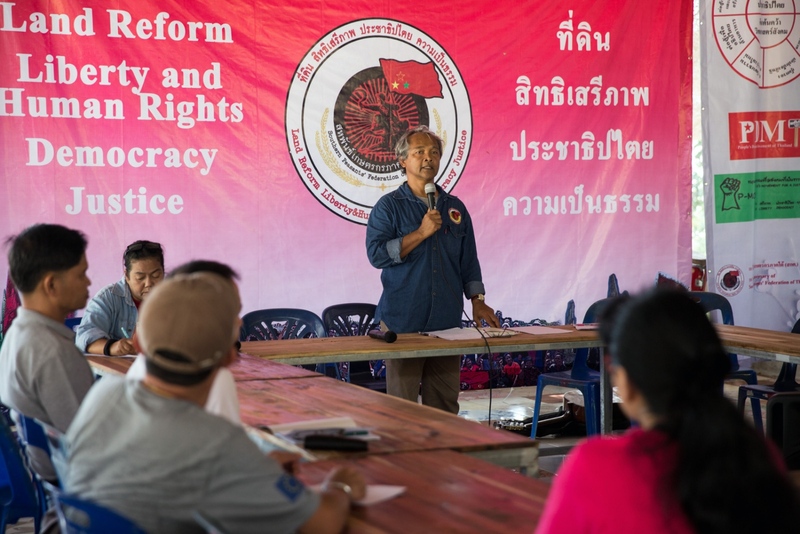 December 2018 marked the 10 year anniversary since the founding of the Southern Peasant’s Federation of Thailand (SPFT) and the organisation held a series of events at Klong Sai Pattana village. Here the locals erect flag bearing the logo of SPFT around the community. December 2018. Members of Klong Sai Pattana community, as well as members of other villages in a similar situation, gather for a group photograph on their their annual memorial day. Events such as this help the communities cope with their situations by eliminating the feeling that they are not alone in the struggle. They hold pictures of the 4 people killed during their prolonged struggle against a palm oil company. The framed photo seen in the photograph shows the first victim called Somporn Pattaphum who was shot dead in 11 January 2010 a few hundred meters away from where they now sit. December 2016. Tawat Ruangsi, 48, stands at the main entrance and security post to Klong Sai Pattana village after having just closed the gate at 6pm. The village tries to limit the number of vehicles entering and leaving during the night and re-opens at 6am. In total the village has 4 security posts which are manned 24 hours a day by the villagers who take it in turn in small groups of 3-4 people. May 2016. Pasit Bunban, 67, points to the boundaries of the communities land and the land of the expired land concession. May 2016. 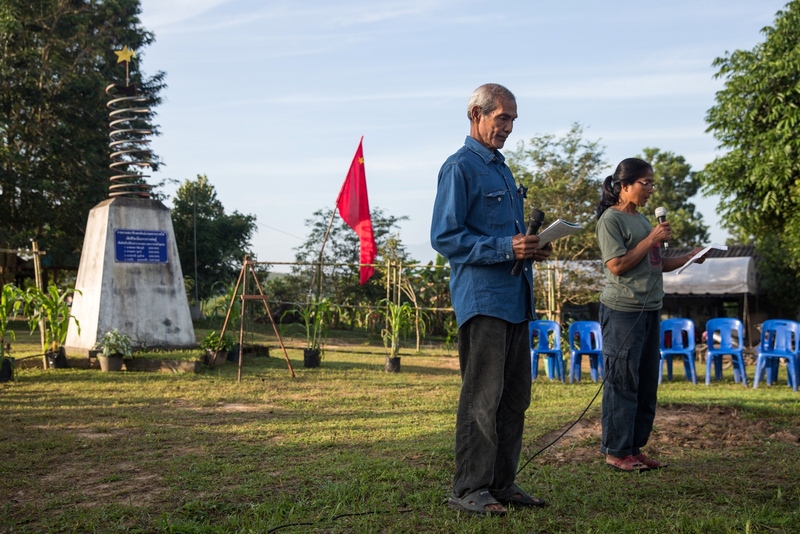 Pasit Bunban (left) and Pi Puang (right) they thank visitors for coming to the 10 year anniversary celebrations since the founding of the Southern Peasant’s Federation of Thailand (SPFT). December 2018. 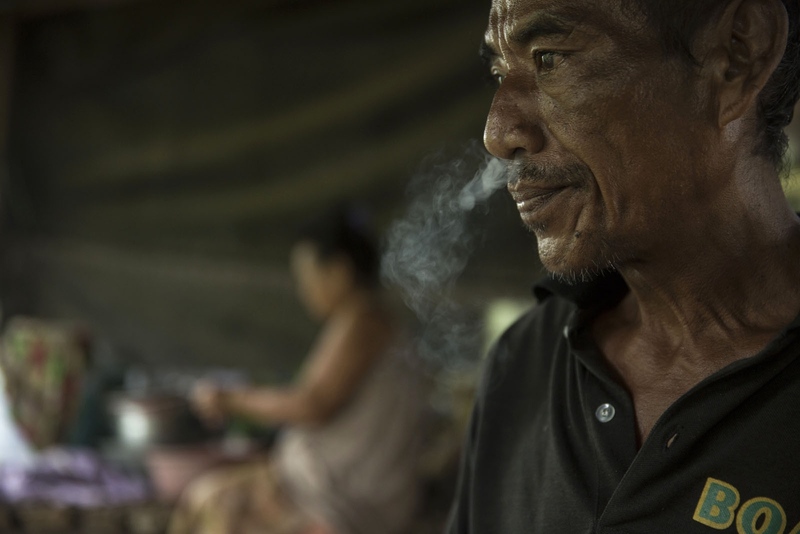 A villager of Klong Sai Pattana stands during an early morning meeting held in the community. December 2018. During the annual remembrance day at Klong Sai Pattana community villagers gather to pay respect to those killed during the struggle. 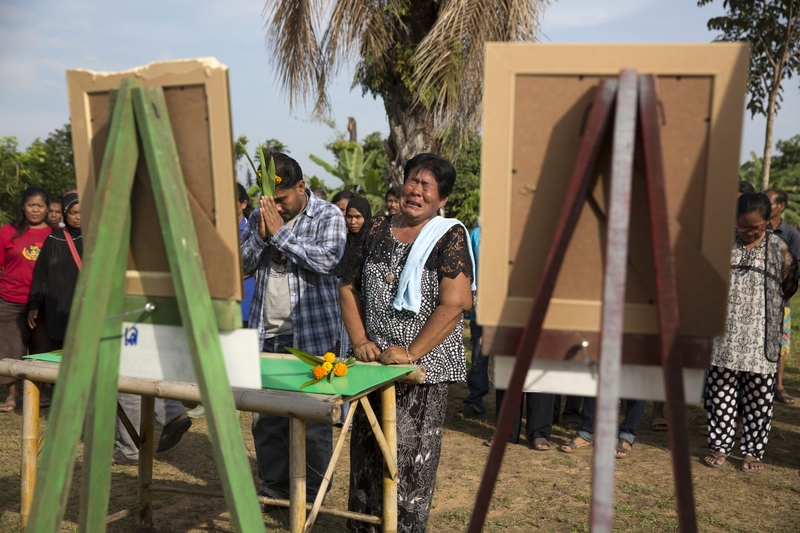 Here the wife of Chai Bunthonglek who was shot dead at his house by two gunmen 11 February 2015 cries. December 2016. 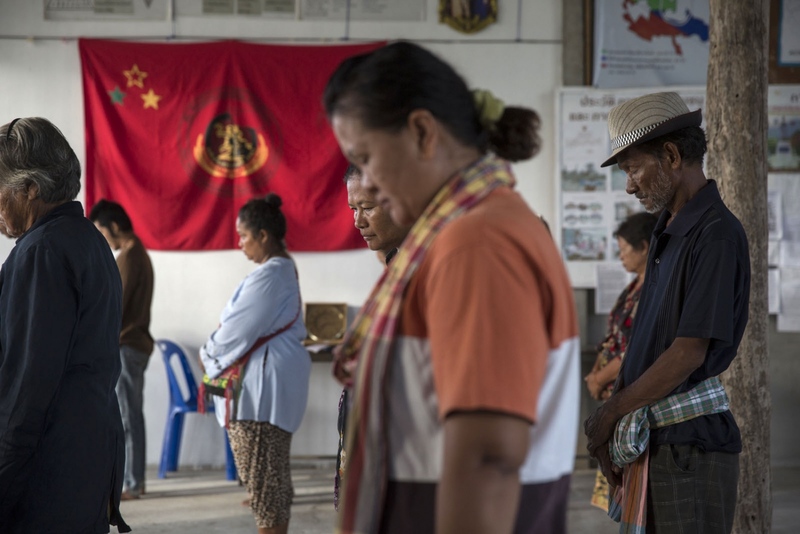 December 2018 marked the 10 year anniversary since the founding of the Southern Peasant’s Federation of Thailand (SPFT) and the organisation held a series of events at Klong Sai Pattana village. 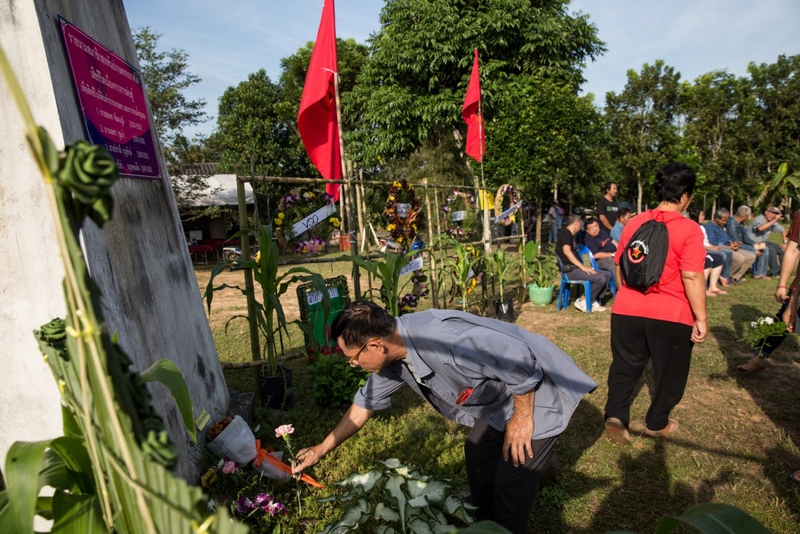 Guests joined from around the country from some of the largest and oldest Thai rights groups, including the Assembly of the Poor and the Northern Farmers Federation of Thailand joined to pay respect to those who died. December 2018. 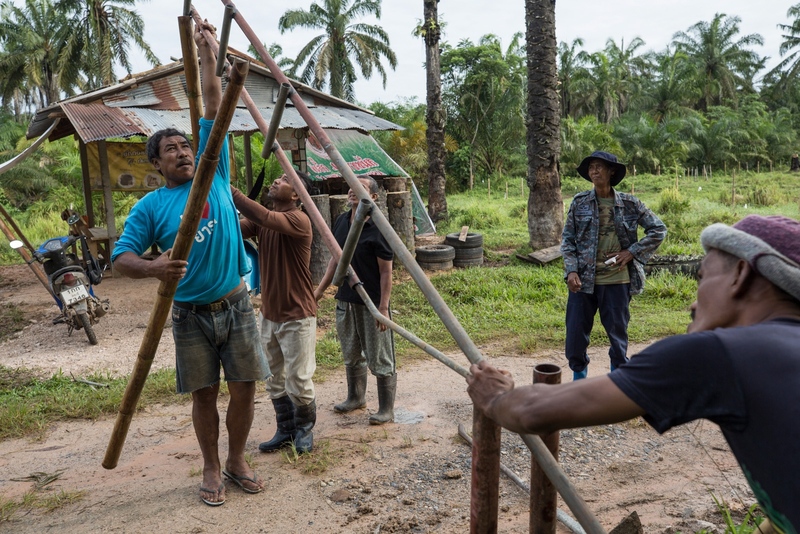 Slowly the community builds new homes amongst the old palm oil plantation. What originally were wooden houses they are slowly saving money to build concrete houses but it is a slow process and done bit by bit. December 2018. 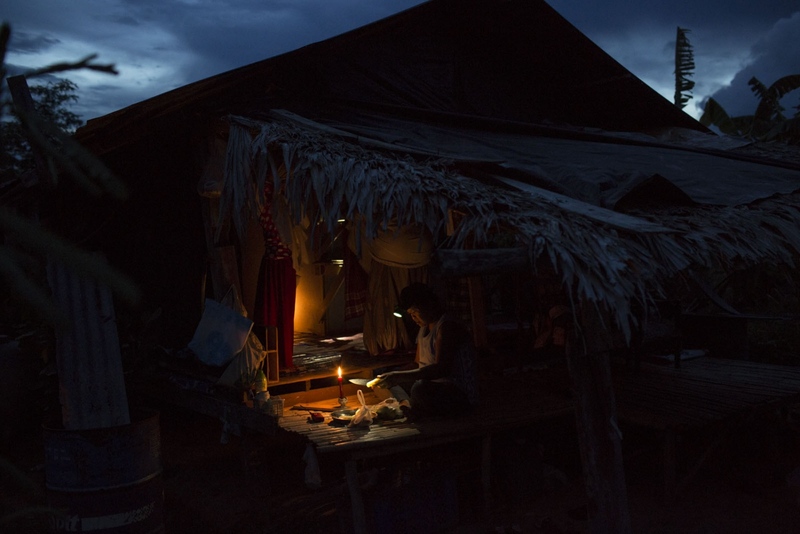 A women cuts a mango using candle light as there is no electricity in the community. May 2016. 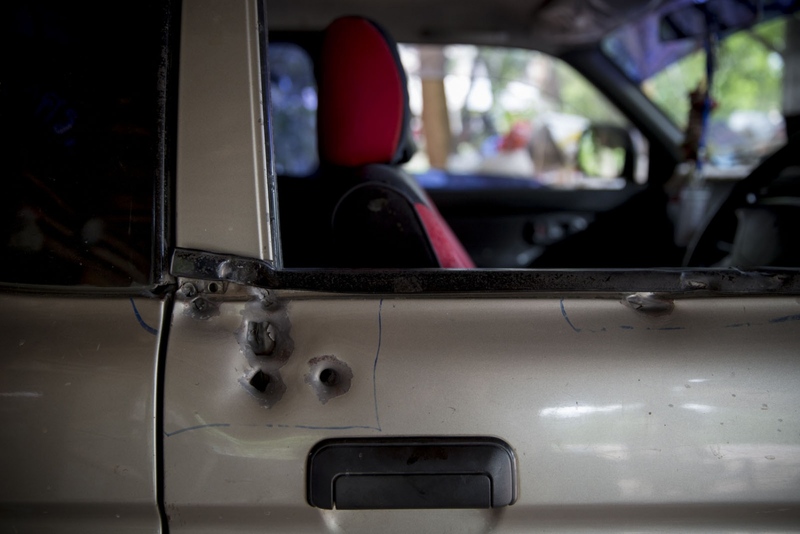 The bullet holes in the side of Supot Kansong's pickup truck where he was shot at close range but survived. May 2016. Supot Kansong lies on his side whilst his wife cuts his finger nails. Only out of hospital for a few weeks his bullet wounds still cause him pain. In 2018 he left Klong Sai Pattana to move elsewhere leaving his wife and son. May 2016. Sukon Dongwun, 54, moves cows in to their pen for the night. The cows are collectively owned by the villagers and people take it in turns to look after them. Any profits from the milk or meat will be divided amongst the community. 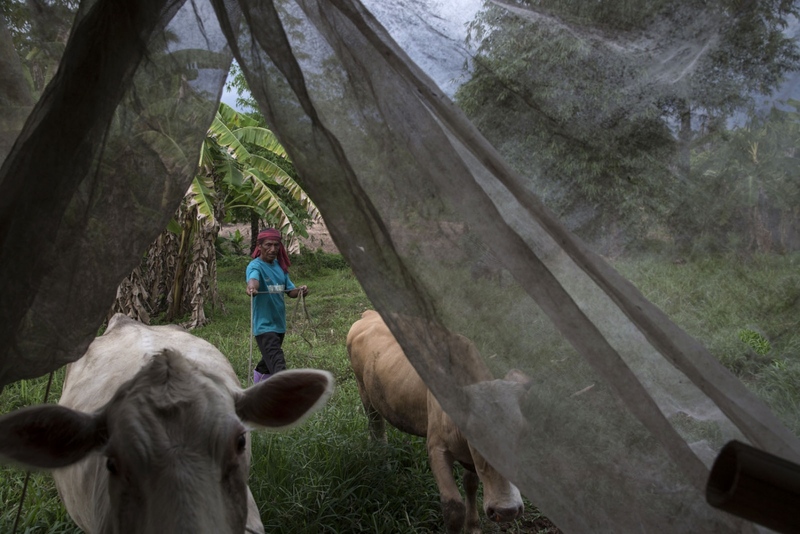 A few years ago keeping cows was impossible as the community was totally surrounded by palm oil plantations. 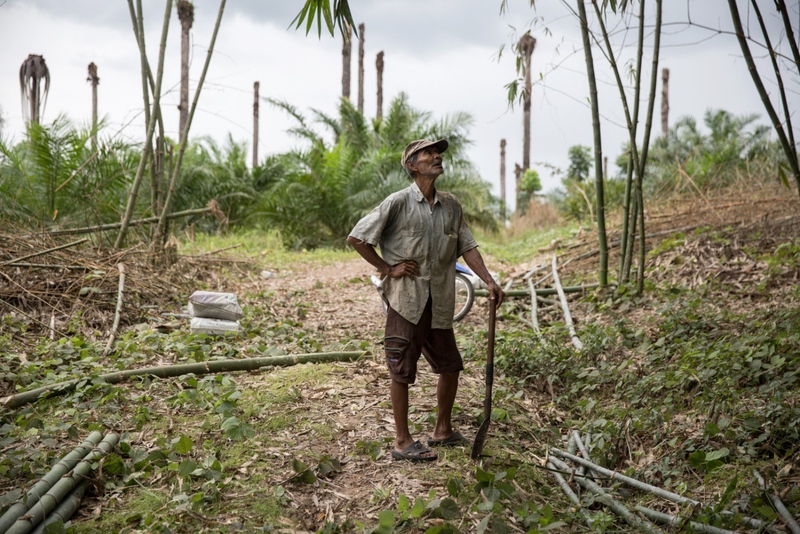 However, gradually over time the community has expanded its territories and turned small areas of palm oil plantations in to farming areas, enough to rear cows. May 2016. Every morning at 7am the villagers of Klong Sai Pattana meet, take role-call, talk about anything out of the ordinary the previous day, voice any grievances and do morning exercises. They understand that in such a prolonged and dangerous battle their strength is in their cohesion. The morning meetings as well as monthly group projects are aimed at keeping the community together and strong. May 2016. 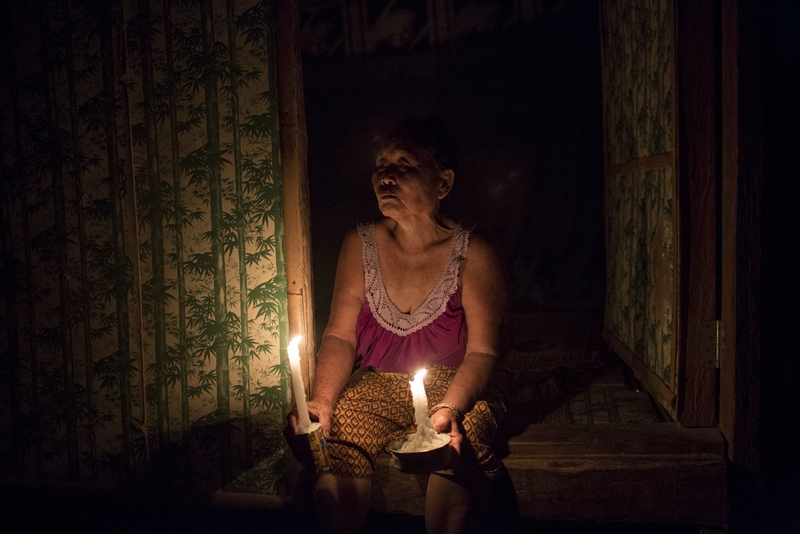 Rattana Seli, 66, sits in the entrance to her hut holding two candles. The village has no electricity so at night mostly candles are used. May 2016. Locals of Klong Sai Pattana community erect a new security post and gate to the village. Safer that it was a few years ago the community has been able to expand its area for farming and also erect new security posts marking the new boundaries of their land. December 2018. 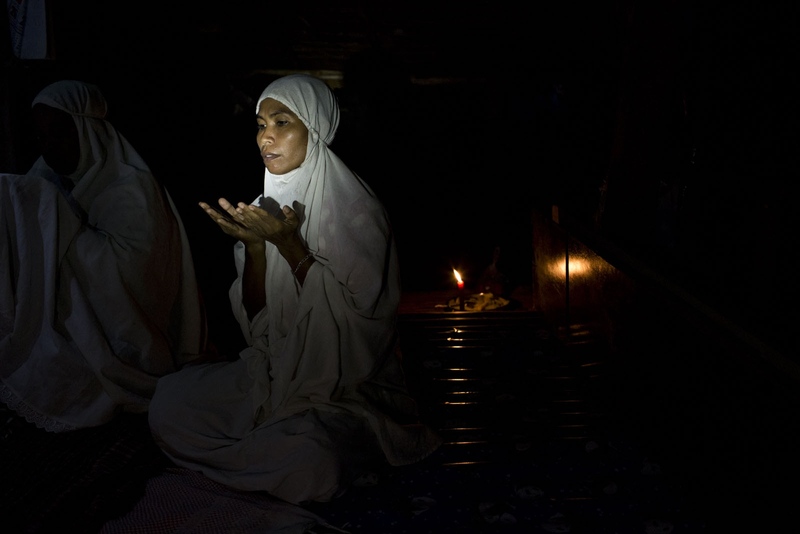 Janya Ruangthong, 36, originally from neighbouring Krabi province prays in her house. Her family is one of five Muslim families living in Klong Sai Pattana. She left her home province for the opportunity to have a plot of land despite the danger. In the structure of the village she is in charge of administration and preparing legal documents for officials and court appearances. May 2016. November 28th marks the memorial day of Klong Sai Pattana village for each of the four people murdered during their prolonged fight to remain on the land. December 2016. 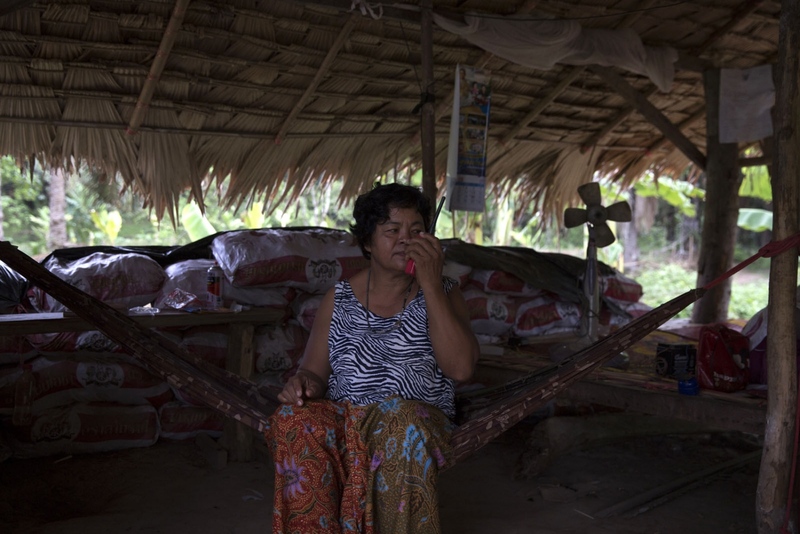 Supot Kalasong, 42, leaves the village in a pickup to travel to Bangkok to submit a document to a government office. In April 2016 Mr Kansong was shot in 6 places by an assassin who had been waiting for him to drive past as he returned to the village. He remarkably survived but has since left the community leaving his son and wife. May 2016. Pitak Kongdi, 52, and other villagers on security duty this night get ready to sleep in a bunker built next to one of the security posts. 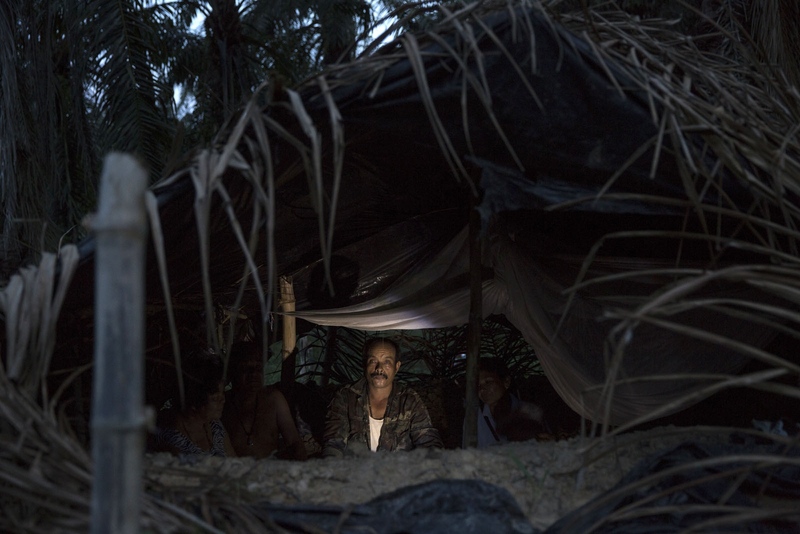 Regularly unknown gunmen fire bullets in to the air and at the village from the darkness of the surrounding palm oil plantation to intimidate the villagers in to leaving the land. 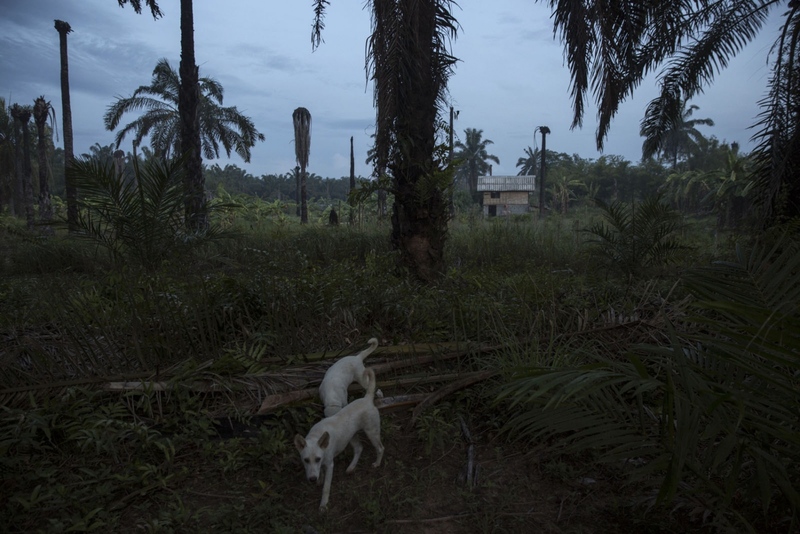 This specific security post sits a hundred meters away from one of the palm oil companies buildings and as a result some members prefer to sleep in this large bunker they made. May 2016. 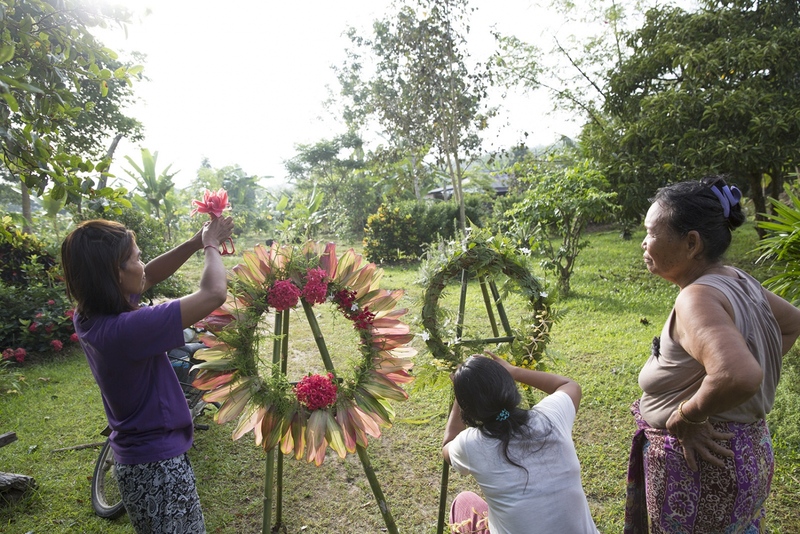 Women make reefs out of leaves and flowers as part of the memorial day of Klong Sai Pattana village in remembrance for each of the four people murdered during their prolonged fight to remain on the land. December 2016. 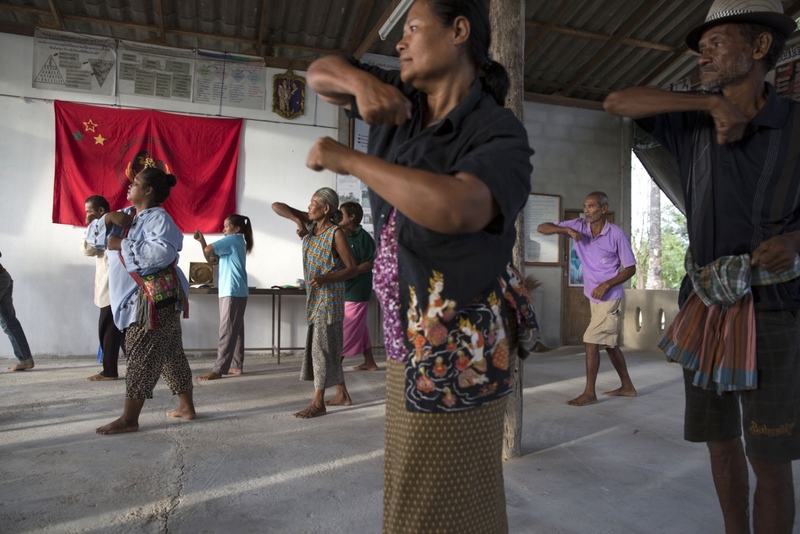 Every morning the villagers of Klong Sai Pattana meet, talk about anything out of the ordinary the previous day, voice any grievances and do morning exercises. May 2016. Pratep Pasaja, 54, makes a radio test whilst being security guard at one of the posts. Many villagers have walkie-talkies so they can communicate quickly if trouble arises. She will stay in the bunker all night until relieved by another team. May 2016. Since the beginning the villagers have only asked for land with which to grow crops to survive. 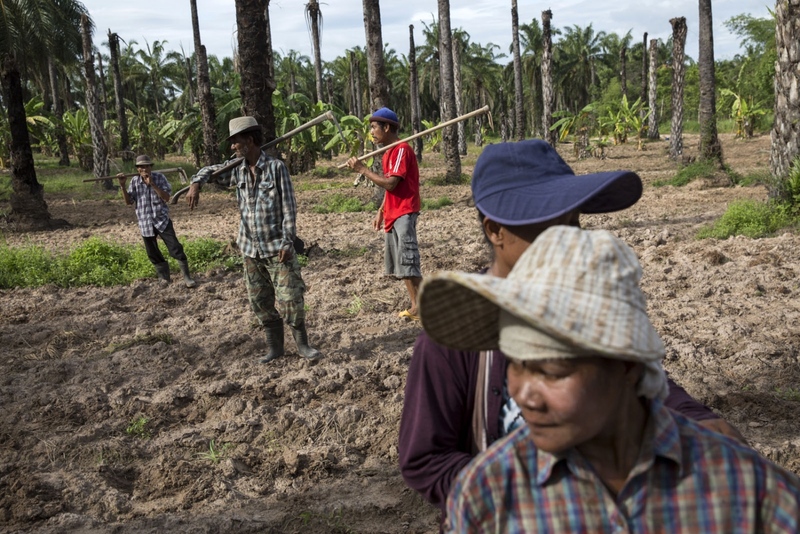 In a communal planting activity that involved the whole community they plant corn on what used to be a palm oil planation. May 2016. 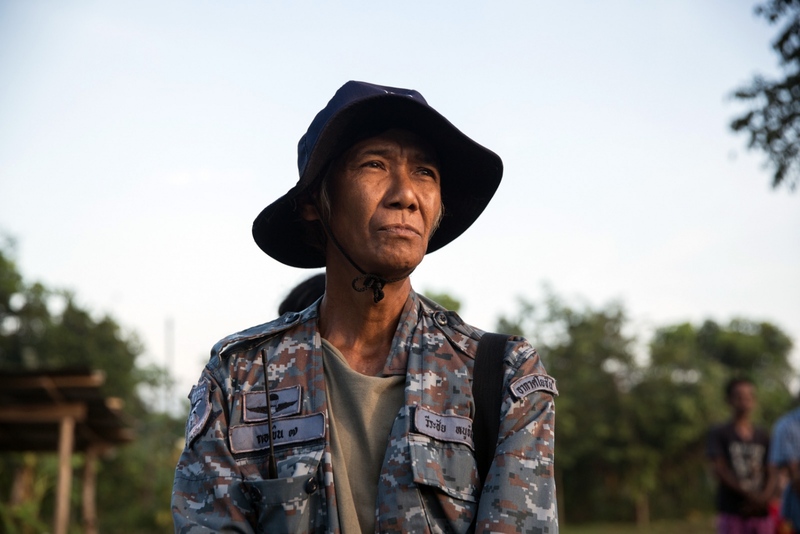 Pasit Bunban, almost 70 years old, has fought for land rights in Southern Thailand for most of his life. He takes a break whilst cutting down bamboo that the community grows to use for building. December 2018. 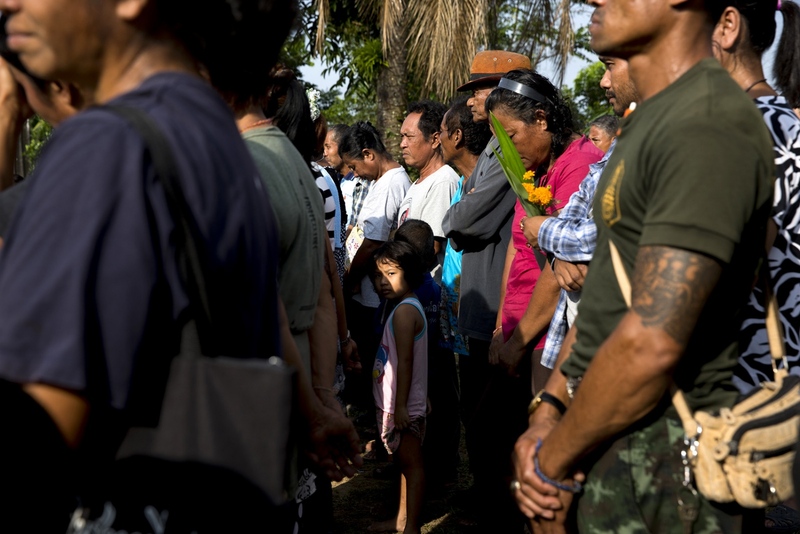 Villagers stand for one minute of silence on November 28th which marks the memorial day of Klong Sai Pattana village for each of the four people murdered during their prolonged fight to remain on the land. On 11 January 2010 Mr Somporn Pannapum who was shot dead whilst having dinner at his home in the village itself. Then on the 19 November 2012 Mrs Montha Chukaew, aged 54, and Mrs Pranee Boonrat, aged 50, were shot and killed while they were on their way to a local market. And then on 11 February 2015, Chai Bunthonglek was shot dead at his house by two gunmen. Sukon Dongwun, 54, smokes a cigarette in a neighbours house. May 2016. 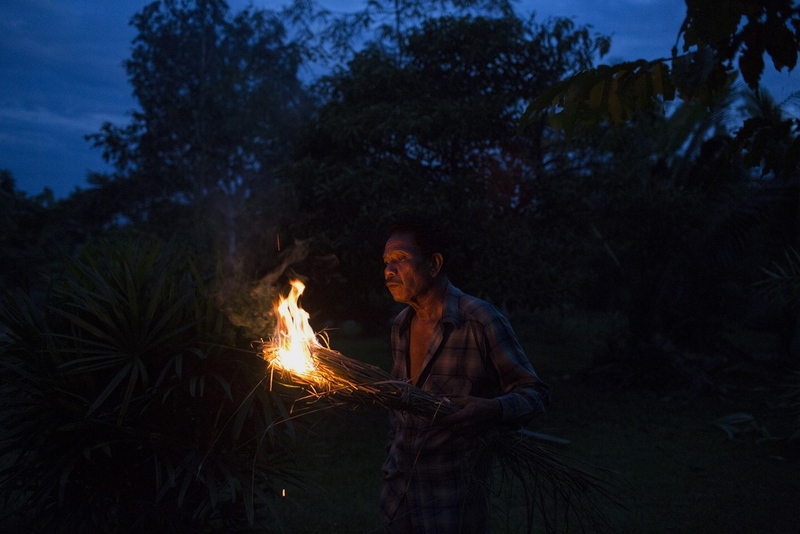 Pratip Rakhungthong, 61, lights dried lemongrass grown in the village to keep away mosquito's. December 2016. A pickup truck leaves the village as the security guard opens the guard post. All vehicles entering the village are documented in books noting the license plate and time of entry and is used as evidence if something happens. Pratip Rakhungthong, a key figure in SPFT feeds the communities chickens and ducks. This communal approach allows the whole community to benefit from the sale of the eggs. December 2018. Pi Kaew, the leader of the Southern Peasant’s Federation of Thailand (SPFT), leads a discussion forum during the 10 year anniversary celebration in Klong Sai Pattana whereby experts on human rights in Thailand and members of other Thai organisations talked and debated. December 2018. 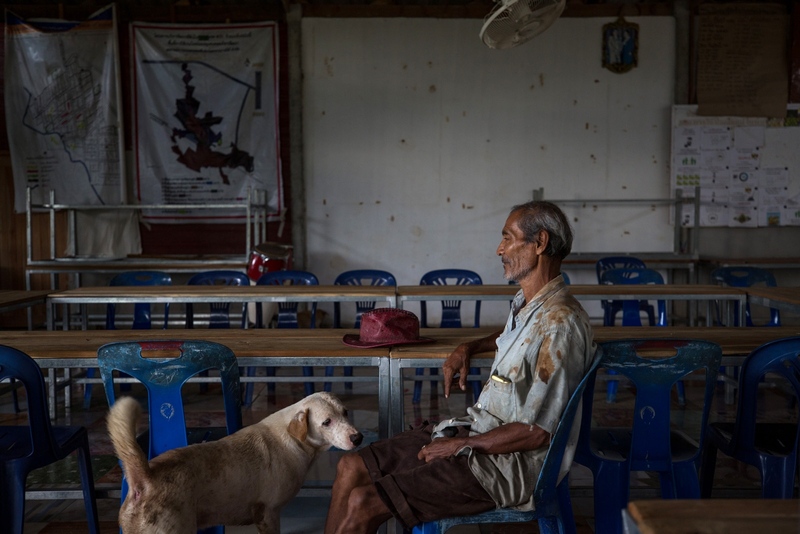 Pasit Bunban, a village elder of Klong Sai Pattana community takes a moment in the community hall located in the centre of the village. December 2018.